In the bowl of a stand mixer, combine melted butter and milk. In a separate small bowl, whisk yeast into warm water and sugar. Let sit for 5 minutes, then add it to the milk mixture. In a separate large bowl, whisk together salt, baking soda and flours. Add them to the milk mixture, stirring to combine. Knead the dough with the dough attachment or by hand for about 5 minutes, then let it rest, covered, for 5 minutes. Lightly grease the outside bottom of two half-sheet baking pans (preferably 13 x 18-inch). Divide dough into two pieces and roll out onto the outside bottoms of the pans, going all the way to the edges and trying to make the dough an even thickness all over the pan. Sprinkle sesame seeds or a mixture of seeds, if desired, onto the dough and go over once with a rolling pin to secure them. Poke the dough all over with a fork and, using a pizza cutter, cut it into 4 x 2-inch pieces. Don’t worry about spreading the pieces apart; they’ll shrink while baking. Repeat with remaining piece of dough. Bake for 25 minutes or until flatbread is a deep, golden brown. Remove from oven and allow to cool completely on a cooling rack. Break connected pieces apart, if necessary. The crackers should be crisp, not soggy or pliable. If they are, let them sit out overnight to crisp them up. I’ve had a thing for crackers ever since I made my own from scratch. 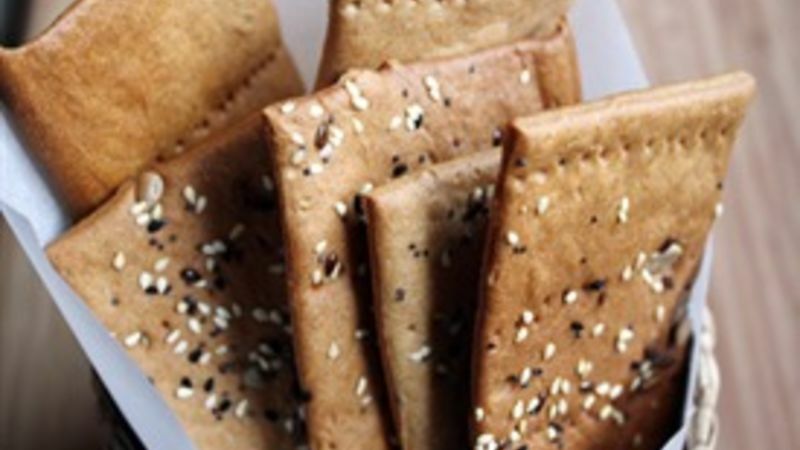 There is just nothing quite like even the simplest homemade cracker. And when I decided to make Swedish knäckebröd for the first time – because not only do I love those rye crisps from the grocery store, but also because I love the word “knäckebröd” – my realization was even further edified. It’s really a crime to even compare these knäckebröd (which means “break bread,” for those sans Swedes in their families) to the rye crisps you get from the store. First of all, they’re not made with any rye flour. Secondly, they’re thinner than rye crisps and, thirdly, some of these are covered in seeds, which I’ve also heard is entirely non-traditional. But I hope you’ll forgive me, as they still serve the same purpose — to carry slices of meat and cheese into your mouth. I usually make two versions of knäckebröd, one with seeds and one without, when I make this recipe to appease those in favor of keeping with tradition. Though I have a bit of a preference towards the former, the latter were equally yummy (and possibly better for holding toppings, as the seeds can overpower other ingredients a bit in terms of flavor). I was pleasantly surprised, upon eating one (then two, then three, then four…then I lost count) of these crackers, to find a hint of a buttery, enriched dough taste. Enriched doughs like brioche and challah always have that distinct rich flavor from the eggs and milk, and these wafers, though egg-free, still offer that delicious taste. Combined with the nutty, savory crunch of sunflower, sesame and flax seeds, I don’t care what they should be called — they’re just worth making.